Open House – Mark Your Calendar! Join us for our All-Ages Open House on Tuesday, February 26, 2019. 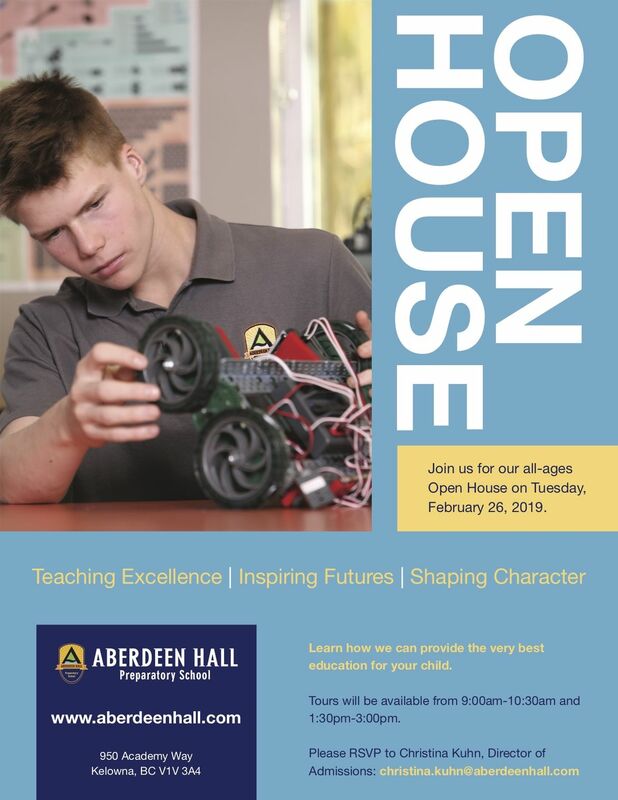 Come see why Aberdeen Hall has earned the reputation for one of the best independent schools in British Columbia. Tours will be available from 9:00-10:30am and 1:30-3:00pm. Meet the incredible staff and students, tour the school and register. Please note: some grade availability may be limited. Preschool is at capacity for September 2019. Aberdeen Hall Preparatory School’s campus is located in the heart of one of Canada’s most beautiful destination locations – Kelowna, British Columbia. Our 44-acre campus (19 donated in 2008, and 25 donated in 2014) is located adjacent to UBC Okanagan and 5 minutes from the Kelowna Airport. The campus is enriched with modern classrooms, facilities, and amenities designed with a university feel. Aberdeen Hall’s campus design allows each student to enjoy an inspiring professional, atmosphere while still enjoying a close proximity “small feeling” campus. Studying and growing in this environment helps create a strong sense of community while providing safety and security. At Aberdeen Hall, students and staff know each other – we truly are a family. “There is nothing more important than the future of our children.